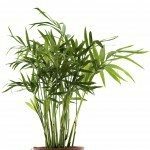 How do I trim my bamboo palm? You can shape the tops down, but that leaves a stubby, flat-topped look. I prefer to achieve reduction of height and thinning at the same time, by pruning out the tallest canes all the way to the base, leaving the shorter ones.